Snowboarder Jamie Nicholls secured a first World Cup slopestyle win of his career as Britons dominated the podium in the Czech Republic. 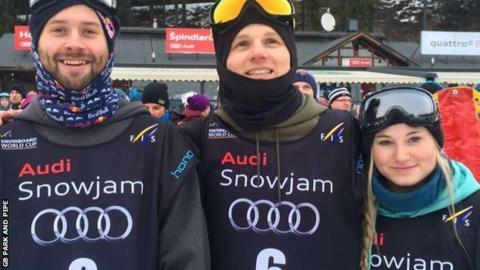 Nicholls scored 87.14, just 0.01 points ahead of USA's Chris Corning, with Briton Billy Morgan claiming a bronze medal with 84.91 at the Audi Snowjam. Nicholls' cousin Katie Ormerod finished second in the women's event behind German veteran Silvia Mittermueller. "I am so happy to finally win a World Cup," Nicholls said. "It's a first for me to get on a podium at a World Cup and I am just so pleased with how today went. "I felt great all day and I was really happy with the run I put down." In alpine skiing, Dave Ryding finished 15th at the World Cup finals. The result cemented Ryding's place as one of the world's top-15 slalom skiers and completed an impressive World Cup season, which included a 12th in Val d'Isere and a 13th in Santa Caterina.